While this blog may be disappointing for all sorts of reasons I was surprised that it was because of lack of Coronation Street content. However, I’ve found out that that I’m the fourth hit for a Google search on ‘Dignity by Dev Alahan’; coming above national newspapers, Coronation Street fansites and ITV’s own website. And all because of an idle Tweet while watching Corrie. I’ll be joining Adsense if the fragrance ever gets released. I’m number one! Does this make me a search engine optimisation expert? 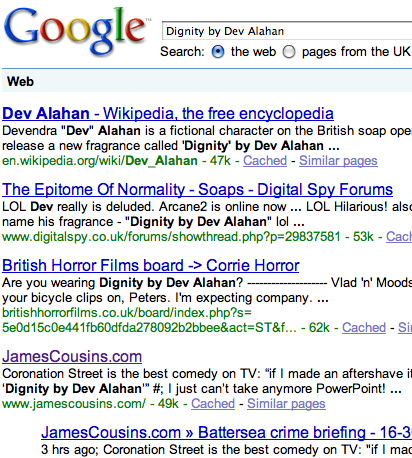 Dignity by Dev Alahan, I'm now number 1 in Google!